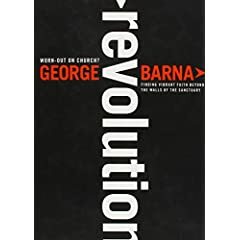 I just finished a book by George Barna and I have to say it is one of the most inspiring reads I have come across in a long time. I want to be a Revolutionary Christian! I pray that I will so live. This entry was posted on Wednesday, May 24th, 2006 at 7:46 pm	and tagged with Barna, Christian, Christianity, George Barna, God, God's Kingdom, Jesu, Kingdom and posted in Reviews. You can follow any responses to this entry through the RSS 2.0 feed. Dude let me borrow this book!